Posts related to the MOOC and independent learning independent study. First of all, let me start by putting it out there that both “artifact” and “artefact” are acceptable forms of the word. As someone who lives in the USA, it seems like “artifact” is the most common form we use, and will stick to it for this whole post. My main goal for this #edcmooc artifact is to try to articulate some of my takeaways from this course, and links to other sources I have found and read over time, from a content and an pedagogical perspective. Up until this course, I had always viewed technology in a positive light (as a future utopia). As an educational technologist, it is my job to find valuable ways to use technology to automate routine tasks (improve scale and efficiency) or innovate (change the process to improve learning outcomes). Of course, I always find roadblocks and pitfalls, but I usually find workarounds to avoid them and make the cost/benefit of using technology tilt to the positive side. As steam power advanced and spread throughout industry, more human workers were needed, not fewer. They were needed not for their raw physical strength (as was the case with John Henry) but instead for other human skills: physical ones like locomotion, dexterity, coordination, and perception, and mental ones like communication, pattern matching, and creativity. (Kindle Locations 787-790). […] economic progress comes from constant innovation in which people race with machines. Human and machine collaborate together in a race to produce more, to capture markets, and to beat other teams of humans and machines. This lesson remains valid and instructive today as machines are winning head-to-head mental contests, not just physical ones. Like Clive Thompson in The Cyborg Advantage, I believe humans will find ways to race with the machine to achieve higher performance, combining the clockwork, cold, analytic machine with the human sense making, pattern seeking abilities. But it will come at a cost, for people who are blindsided or feel entitled to their current way of living. Although it has not been addressed directly in the course, the automation of education has become a larger concern for me. I understand the political pressure of making education “better,” but I believe that automating education through technology has a fundamental flaw when it is only concerned with getting more students through the system using standardized (another word could be “sanitized”) content and testing. Sure, some modules can be automated. Some learning modules are factual by nature, and have a clear right or wrong answer. But should we trust algorithms to control our learning flow, especially for higher-level skills at the top of Bloom’s taxonomy? Teachers will have access to an ever-growing body of knowledge, and will be asked to curate that knowledge and present it to students in a palatable fashion. I think teacher freedom and guidance is, more than ever, needed in our age of transparency. As everything we do gets recorded, how can we make sure the next generation of students will not step into booby-traps that could affect their livelihood 10, 20, or 50 years from now, as employers and colleagues stumble upon digital faux-pas? For more information technology literacy, I invite you to follow the work of Howard Rheingold. Being human has to be more than the simple fact that we are evolved biological beings. In They’re Made Out of Meat, this ridiculous fact is exposed as being something repellent, but it doesn’t tell the whole story. What gives human beings the advantage over other biological beings, such as other mammals, is our superior use of our brain functions, which gives us the chance to enhance ourselves with the use of technology. 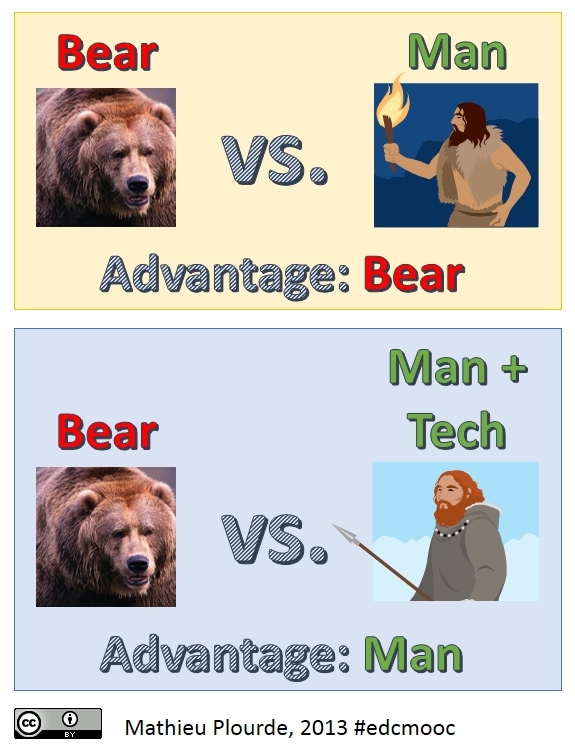 I’ve illustrated this advantage below (UPDATE: Bear + Tech vs. Man + Tech = Advantage Bear, LOL, Matthew Jones). As society becomes more complex and more productive, we all become interdependent. Accessing the Internet from your computer requires a web browser, an operating system, a computer, a router, and internet connection, an internet provider, link between internet providers, servers, data warehouses, air conditioning, electricity, power plants (natural gas, sunlight, wind, coal, hydro plant, etc. ), corporation, governments, and workers operating all of this infrastructure. As we live more of our lives in the cloud, we make ourselves vulnerable to any layer going bad, as illustrated in the following image of the game Jenga. My last thought goes toward an idea expressed in True Skin. If we can become transhuman, and transfer our consciousness through technology, aren’t we also exposing ourselves to becoming hackable? So far, we have not been able to truly take control of one another, for better (such as a surgeon taking over the movement of an apprentice) or worse (the Manchurian candidate). I hope these ramblings make sense to you, and welcome any feedback or comments! As a part of my Ed. D., I have enrolled in an independent study this fall. With Tina Trimble as a buddy, we are exploring independent learning through MOOCs (and other non-denominational open learning platforms). Here is our proposal for the fall. Knowing that I was going to do this, I actually cheated and completed an open course early in the semester. I wanted to included some of the key points about my experience in a blog post, because I believe the future of scholarship is open. 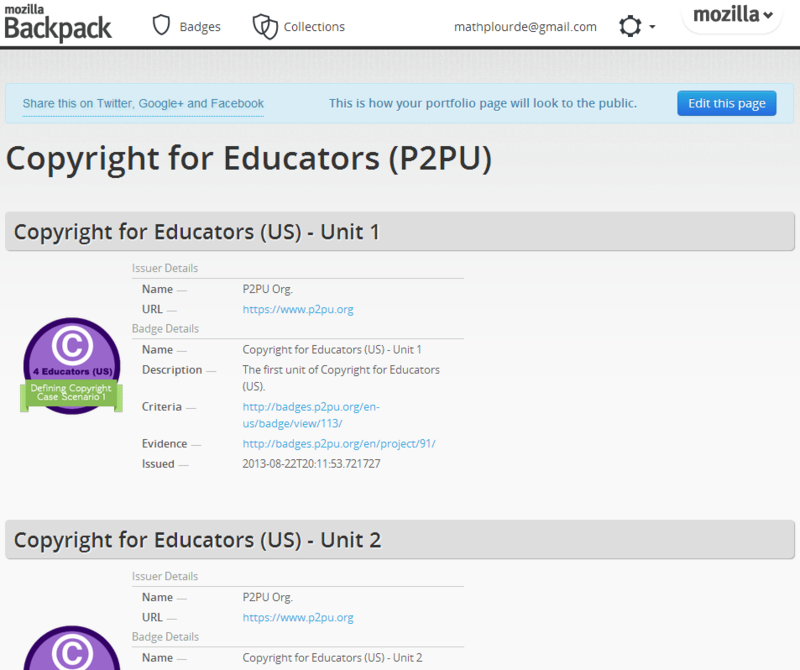 Copyright for Educators (US) is an open course offered by the School of Open at Peer 2 Peer University (P2PU). Peer 2 Peer University […] is a grassroots open education project that organizes learning outside of institutional walls and gives learners recognition for their achievements. P2PU creates a model for lifelong learning alongside traditional formal higher education. Leveraging the internet and educational materials openly available online, P2PU enables high-quality low-cost education opportunities. This six-week course was offered in August and September of 2013, and was moderated by Laura Quilter, a Librarian and Lawyer who works for the University of Massachusetts Amherst. My interests in this specific course was twofold: I wanted to learn more about copyright and fair use, and I wanted to experience a free and open online course from P2PU, which seemed more palatable to me than massive initiatives. To my knowledge, the enrollment for this course was very limited (capped around 40 or so), so the experience was very intimate. The course design was pretty simple (it had to be for a six-week course). The first thing we needed to do to enroll in the class was to find a teammate, a buddy who would share the coursework and would act as a partner to discuss course materials. Once who participants had paired up, they need to announce their alliance on the course’s Google Group to be officially enrolled. I tagged up with someone from Illinois, and we were all set. There were six content modules for the class, all logically scaffolded to start from the basics of copyright to more fuzzy interpretations of fair use. After modules two, four, and six, participants had to complete an assignment, which was designed as a case study centered around the practices of an educator asking for our help. Successfully completing an assignment allowed participants to submit their project to get a digital badge from P2PU. I’ll get to that a bit later. In addition to the content and assignments, the instructor held weekly Google Chats (which turned into Google Hangouts) to answer question more directly. In general, I thought the experience was very worthwhile. The next sections will present some of the points that really made an impression on me. Dropout rates in MOOCs are usually pretty drastic. In a 2012 TED talk, Peter Norvig, co-founder of Udacity, states that 20,000 out of the 160,000 participants who enrolled in his 2011 Artificial Intelligence class complete the course. That’s a 12.5% completion rate, which might –or might not be– a big deal. Establishing a buddy system from the get-go was probably one of the most interesting process for this class. It basically forced participants in committing for the length of the course, and since the enrollment was capped, put the pressure on people who got in to commit or to leave their seat to someone on the waiting list. The pacing involved in having to produce teamwork has always been a strong motivator for me, and starting class that way gave me a boost in my level of commitment. Unfortunately, my buddy had to drop the class and I had to find a new one after the first assignment, but I was lucky enough to find another person who lost their partner early one, and it was smooth sailing from there on. Most weeks, only two people who show up for the open hour on Google Hangouts. I ended up having wonderful conversation with our instructor, conversations I would have had to pay for outside of the context of this (free) course. The small number of participants, although not very favorable to generating forums discussions, was very favorable to establishing rapport among buddies and with the instructor. As a side story, the instructor of the course was not very familiar with Google Hangouts, so I took charge of drafting some guidelines for participating in the open hour. This is very much in line with P2PU’s perspective on learning. Everyone can learn from everyone. Course contents and student projects were made available openly on the web. That was the only way participants could submit their assignments. Having to submit your project openly means that everyone can see your work, good or bad. As a learner, you basically benchmark your work with the Internet, and hope for feedback, good or bad. Many people do not feel comfortable with showing their vulnerable side, but I think in this case, it was for the best. Now, this is where all the hard work pays off, in my opinion. P2PU uses a framework for digital badges based on the Open Badge Backpack. What are digital badges, you ask? First of all, the idea is not new. Many social media platforms, such as Foursquare, award badges for checking in to local businesses. They turn geo-location into a game (reference: gamification). And just like Girl Scouts, lifelong learners complete challenges and are recognized for completing those challenges. Digital badges are a way to issue, earn, and display completed tasks and acquired skills. Completing the assignments allowed me to submit my projects for badges, which were awarded by the instructor. The work I produced, the instructions of what was required to get the badge, the issuer of the badge, the person who assessed the work and awarded the badge, everything in the process is openly available. You can now look at my backpack and see my work online, reflecting real project and real feedback from real people, and you can dig as much as you want if you doubt of the quality of the work, because it’s all there in front of you, a couple of clicks away. I think that the idea of using digital badges will have a great impact on education in the years to come. It is such a nice way to showcase your work as a learner. And since the Open Badges backpack is an open source project, it can be connected to any platform on the web. This course has been a joy to work through. My partners, the instructor, the content, the assignments, the setting… Everything felt very intimate and very open. I doubt courses supported by the big guys (Coursera, EdX, Udacity) will ever have this feeling. But keeping low overhead costs and small enrollments has its benefits, and this course has proved it to me. A big thank you to my partners, Caitlin and Elizabeth, and to Laura Quilter as an instructor. This was a very interesting and enlightening course, and I could not have done it alone.